GUARANTEED CASH PRIZES, 50/50 RAFFLE, DOOR PRIZES. 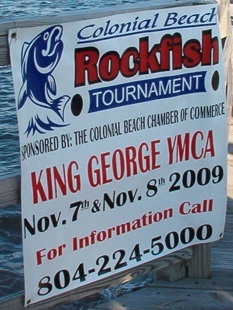 The Colonial Beach Chamber of Commerce sponsored Rockfish Tournament event usually takes place in early November of every year. For the past few of years, the weather has been cooperative making the event that much more successful. Captain Roger Grissom of the Reel Intimidator brought in the winning 19.5 lb rockfish on Saturday Nov. 12th at around 3:30 p.m., measuring 35.75 inches and capturing the top cash prize of $5,000, the Big Boy Calcutta award with a cash prize of $1,600 and the Special Angler Calcutta with a cash prize of $495. Coming in second for the Cash Prize division was Captain Bob Ackerman who caught a 17.55 lb. Rockfish aboard the Ms. Amy Sea, netting him $1,5000. Third place ($500) was Captain Wink Elder aboard the Gladys Marine with a 15.1 lb rockfish. Angler Matthew Hockman took home $250 for his 14.2 lb fish caught aboard the SaltEd, under Captain Ed Roach. First place went to Kristy Look who reeled in an 11.25 lb. Rockfish measuring 31 inches. Second place: Tammy Rawlings whos fish weighed in at 10.85 lbs. Third place: Donna Martinez with a fish weighing 10.35 lbs. Two families participated this year in the Special Angler category. Andy Martinez brought in the the first place trophy with his 7.3 lb Rockfish caught aboard The “John Russell” under Captain Sullivan. Aboard the same boat Joe Gittinger brought in the second place trophy with his 6.15 lb fish. On Saturday Will Gordon won the first place trophy for his 6.8 lb rockfish while fishing aboard the kayLeigh under Captain James Keiffer. Second Place in the Youth division was Jacob Dameron, but Andrew Rammo accepted the award as well. The boys were fishing with their fathers Rick Rammo and Captain Adam Dameron on the 26-foot “Knot It” hailing from Lorton, Virginia. Third place Youth Division award on Saturday went to Jaxton Jett and his 3.95 lb. rockfish measuring 22.5 inches. Jett fished from The Parker under Captain Jack Heasle. The Youth Division encountered a tie on Sunday. Both Matthew Hockman and Will Gordon brought in fish weighing exactly the same, (11.8 lbs.) Matthew’s fish measured 30 inches and Will’s measured 30.25 inches. The rules in this tournament state that tie-breakers are based on who brought the fish in first. Matthew arrived at 1:50 p.m. and Will came in to the dock at 3:30 taking home second place on Sunday. Third place trophy went to Jaxton Jett for his 28 lb fish which was four and half pounds heavier than his prize winning fish on Saturday. 1st: Kiley Ferrari-10.92 lbs. 2nd: Janet Markwith-10.56 lbs. 3rd: Carolyn McIntyre-9.82 lbs. Youth Division Day 1 1st: RJ Abell-4.06 lbs. 2nd: Patrick Nugent-2.82 lbs. Day 2 1st: Jimmy Tippett- 8.30 lbs. 2nd: Jace Jett- 6.20 lbs. 3rd: Jacob Damron- 5.56 lbs. Special Anglers Day 1 1st: Sarah Capp- 4.86 lbs. 2nd: Joe Gittinger -2.84 lbs. Day 2 1st: Travis Smith-9 lbs. 2nd: Morgan Howard-8.80 lbs. 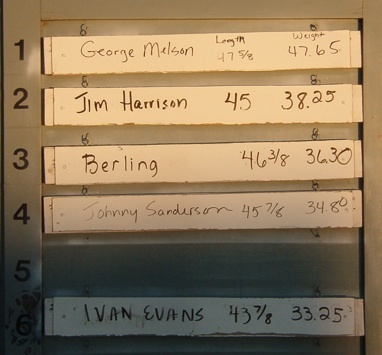 The 2013 Rockfish Tournament took place on November 8 - 10. 1st - James Harrison Jr., 7.24 lbs. 2nd - Patrick Nugent, 6.5 lbs. 3rd - Jace Jett, 6.24 lbs. 1st - Erin Hall, 9.86 lbs. 2nd - Luke Mooney, 8.26 lbs. 3rd - Jace Jett, 5.72 lbs. 1st - Christina Viviers, 8.62 lbs. 2nd - Lauren Gwin, 6.68 lbs. 1st - Mike Harris, 14.16 lbs. 2nd - Scott Dickens, 12.36 lbs. 3rd - John Weber, 12.10 lbs. 4th - Matt Mathes, 11.84 lbs. 5th - Jeff Hammett, 11.60 lbs. 1st Place - Robert Wurm, 34.6 lbs. 2nd Place - George Hall, 26.35 lbs. 3rd Place - Rick Garrison, 24.15 lbs. 4th Place - Dave Chatham, 17.20 lbs. 5th Place - Alvin ”Frog” Auringer, 16.70 lbs. 1st Place - Amanda Wurm, 10.75 lbs. 2nd Place - Deborah Hobbs, 9.45 lbs. 3rd Place - Michelle Johnson, 5.70 lbs. 1st Place - Aaron Bassie (age 13) 9.65 lbs. 2nd Place - Luke Mooney (age 11) 7.55 lbs. 3rd Place - James Harrison Jr. (age 6) 7.45 lbs. 1st Place - James Harrsion Jr. 10.10 lbs. 2nd Place - Larry White (age 12) 8.20 lbs. 3rd Place - Luke Mooney 7.85 lbs. Brian Mays- 37 5/8" 19.25lbs. Joseph Morgan- 39 1/4" 19.10lbs. Jimmy Tippett- 38 1/8 18.85lbs. Jimmy Tippett- 43 3/8" 29.55lbs. Hunter Burnett- 32 1/2" 27.5lbs. Calcutta Winner was John Sanderson with two fish of 68.65lbs. Sponsors: YMCA, Ashton Daycare, Wilkerson's Seafood, Potomac River Charters. 1st Place: Cameron Warfield, boat #76. 4.6 lbs., 23 1/2 in. 2nd Place: Austin Tippett, boat #3. 3.2 lbs., 21 1/4 in. 3rd Place: Patrick Nugent, boat #100. 2.7 lbs., 20 1/2 in. 1st Place: Joseph Morgans, boat #96. 6.71 lbs., 27 5/8 in. 2nd Place: Kandice King, boat #34. 4.45 lbs., 22 3/8 in. 3rd Place: Austin Tippett, boat #3. 4.35 lbs., 23 in.